Delhi High Court (HC) on Friday came down heavily on the Central Bureau of Investigation (CBI) over the delays in finishing the probe against controversial officer Rakesh Asthana, caught for accepting bribes. Not allowing CBI request for a further six months to finish the open and shut bribery case, the High Court asked CBI to produce the details of a probe including Letters Rogatory (LR) to foreign countries in connection with the bribe charges. Chaos in the CBI and intervention of the Government started in CBI after the then Director Alok Verma ordered registering a First Information Report (FIR) against the then Special Director Rakesh Asthana on October 15, 2015. As per the FIR, the bribe giver Sana Satish Babu deposed before the Court as to how Asthana took money from him through certain persons stationed in Dubai for saving him from a case related to the controversial meat exporter Moin Qureshi. He also detailed the role of Research and Analytical Wing (RAW)’s Dubai station head Samant Goel in the bribery episode involving the extortion racket based in Dubai. If a chargesheet is filed, then the Gujarat cadre IPS officer Rakesh Asthana has to be suspended from service. Asthana’s petition to quash the FIR was rejected by the HC. 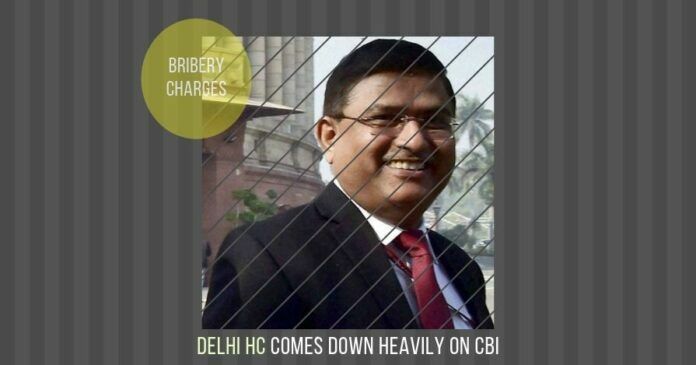 The HC ordered CBI to finish the bribery case probe within 10 weeks. But on the last week of March, CBI sought six more months to finish the probe. It is learned that lobbies connected with Asthana were trying to file a closure report in the trial court and many officers objected after the High Court’s strict orders. Justice Mukta Gupta came down heavily on the dilly-dallying by the CBI in this case on Friday and posted the matter for April 23. During arguments, CBI told Court they can finish the probe in four months when expressed displeasure for seeking six months time. The latest CBI demand for sending LR to foreign countries is seen as a delaying tactic. If a chargesheet is filed, then the Gujarat cadre IPS officer Rakesh Asthana has to be suspended from service. After the CBI chaos, the Government shunted him to a non-relevant post as the head of the Bureau of Civil Aviation Security, which mainly looks into issuing annual passes for entry into airports. The same is the case of Punjab cadre IPS officer Samant Goel, who is currently in the RAW Headquarters. Though many corrupt lobbies are trying to save Asthana and Samant Goel, after the Courts intervention, many CBI officers are not budging to the pressure. Many officers point out that as the bribe giver industrialist has deposed before the court detailing the mode of payments to Asthana, the trial court is not expected to agree with the closure report and it would dent the credibility of CBI further. This is not the first time Asthana is facing bribery charges. He was caught in the Sterling Diary case for accepting more than Rs.3.5 crores from the fugitive promoters of Sandesara Group, supported by Congress Treasurer Ahmed Patel. CBI and the Enforcement Directorate (ED), in their chargesheets mentioned the role of Ahmed Patel’s son and son in law’s money trail with Sandesara Group based in Gujarat. Controversial Gujarat cadre IPS officer Rakesh Asthana was straddling two boats, with a foot in each. He was close to top BJP leaders like Amit Shah and Prime Minister Narendra Modi from Gujarat as well as with Ahmed Patel like many cunning Gujarat cadre IAS and IPS officers. When he was caught in Sterling Diary case in mid-2017, Congress kept quiet due to his proximity to Ahmed Patel. Previous articleIs Naidu rant a story of sour grapes?